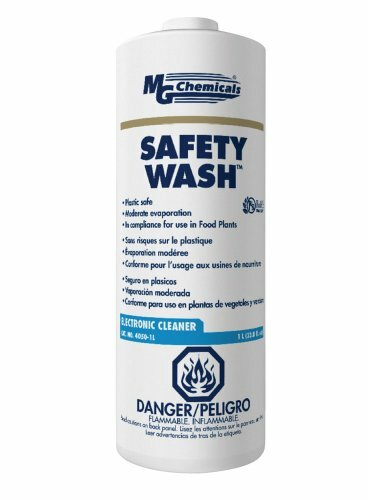 Safety wash electronics cleaner (liquid) is a powerful, plastic safe and low toxicity electronics cleaner. A special blend of ethyl alcohol, isopropanol and ethyl acetate. Effective at removing oils, greases, inorganic and organic soils, smoke, flux, and ionic residues from PC boards, office and medical equipment, connectors, electronic or mechanical parts, workbenches, relays and semiconductors. An excellent choice when a cleaner slightly more aggressive than IPA is needed. Extra effective with the use of M.G. 852 and 853 hog hair cleaning brushes. Flammable. ROHS Compliant.